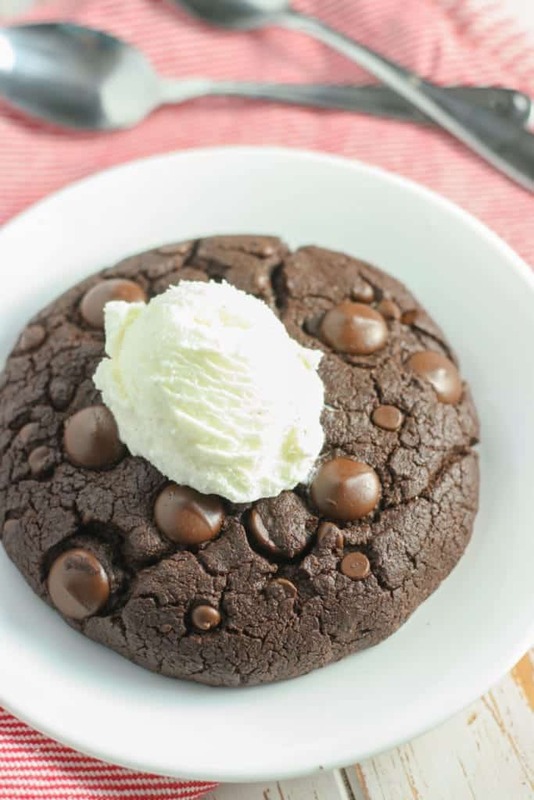 A GIANT Death by Chocolate Cookie for all those chocolate lovers out there. Made with a touch of whole grain flour, cacao powder for rich flavor, & coconut oil for a clean-eating, dairy-free friendly dessert for two! Sooo HI, hello, it’s me. On Valentine’s Day. Sharing with you a ridiculously cliché chocolate recipe ON Valentine’s Day. Who am I? Oh, a food blogger, that’s right. 😉 But I couldn’t NOT share something chocolate with you, I mean… come on. I’d share this any day of the week because I love chocolate, duh. But on this lovely little “holiday” I figured, why the heck not? Let me be honest here, I don’t really care about Valentine’s Day. Yeah, it’s true. I know many of you feel the same way. I’m the type of person that likes to “be different” and do things my own way. So a holiday TELLING me I need to be all lovey-dovey and give a heart-shaped card and chocolates, is not how I roll. I can’t help it, something about it all is just not for me. I’ve always been one that likes to “march to the beat of my own drum”. I guess some could say I’m stubborn…Which leads me to how me and my husband met. I’m going to give him a name today: DREW. There, you have his actual name. Not a fake one to protect his identity. If you really want, you can call him Drewby, as that is how it’s been in my phone for the past 10 years. You see… Drew and I first met in the 5th grade, officially. The first time all of the elementary schools joined into the “Intermediate” building we called it, home of the 5th and 6th graders. I didn’t actually know him then, just that one of the boys I was friends with from elementary and him were best friends. And that he was tall. VERY tall. But I digress… So we went throughout middle school and our early HS years having mutual friends. It wasn’t until 10th grade that I got wind from a friend that Drew “liked” me, but I didn’t really pay too much attention. I nervously laughed it off, as I don’t take compliments well I suppose. I think I was also dating someone else for a hot second, truth be told, but I was kind of “meh” about relationships anyways then. Alright, so then came 11th grade, and Drew and I started hanging out with some mutual friends. I again, just shrugged off the fact that he liked me. Fast forward to spring time, where we were hanging out on the weekends, chatting on the phone for hours (yes the HOME phone, as I did not have a cell phone until after I graduated HS) and I finally realized that I maaybbeee liked him too. But I was still very apprehensive. Then this happened: I needed a ride home from school and he BRIBED ME to be his girlfriend. True story. He said “I’ll give you a ride home if you agree to be my girlfriend.” Ummm, what? I had this thing with labels and I wasn’t sure if I wanted to technically put a label on it, but I needed a ride home… so clearly I had no choice but to be his girlfriend right then and there. I think I groaned and said “Fine”. HA, I’m ssoooo romantic. Not to say we haven’t had our ups and downs. Relationships are hard work! We took a break in college for a few months, but it was the best thing we (and by “we” I mean, “I” to be honest) could have done. It made our relationship a hell of a lot stronger, and we worked through some issues (again, I). And of course now we’re MARRIED. Coming up on 9 months! I’m glad Drew was so very relentless with me. He honestly is my best friend, tells me when I am being crazy, which I realize is usually the case, and he makes me laugh all the time. When I write about the things he says on here, I wish you could all hear it for yourselves. I can’t keep track some days. He is just ridiculous. 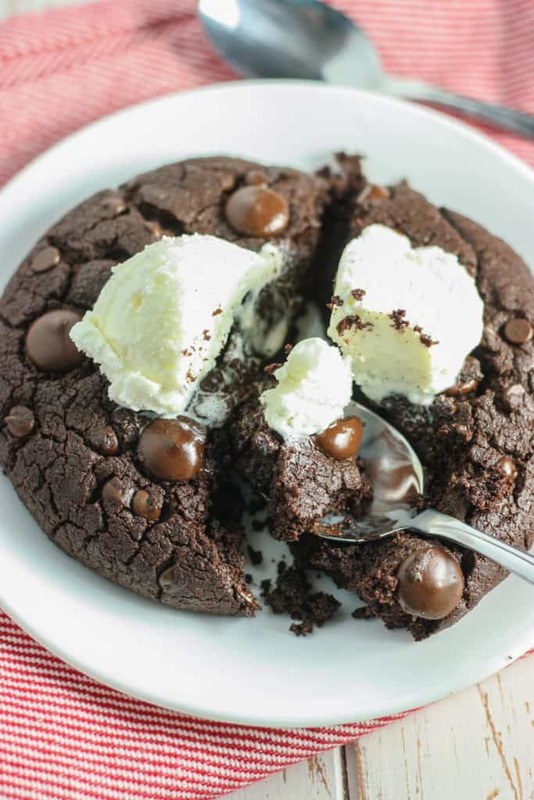 So in celebration of LOVE (Valentine’s Day or not) we’re making this Giant Death By Chocolate Cookie. 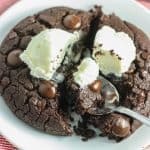 It’s a thick, chewy, rich, and perfect for the chocolate lover in your life! And we had it with ice cream because, well… I’m not going to lie, we love ice cream. 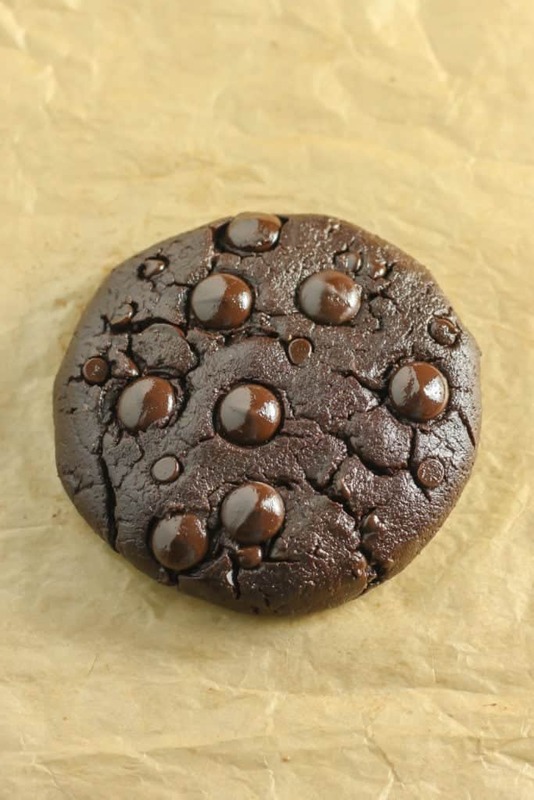 A GIANT “Death by Chocolate Cookie” for all those chocolate lover’s out there. Preheat oven to 350F and line a small baking sheet with parchment paper, set aside. In a small bowl combine cacao powder, whole wheat white flour (or all-purpose, whole wheat), baking soda, and salt. Make sure no clumps of flour or cacao powder are present. In a medium bowl, whisk vigorously (yes, vigorously) chocolate nut/seed butter, coconut oil, and sugar. Whisk in 2 TBS beaten egg until evenly combined. Using a large spoon or spatula, gently stir in dry ingredients until cookie dough forms. Fold in mini chocolate chips and dark chocolate chips. Shape dough into large ball, then flatten into thick circle, about the size of your palm. Place cookie dough on prepared baking sheet, and bake for 12-15 minutes. Allow to cookie to cool on baking sheet for 10 minutes, then serve on plate for two! 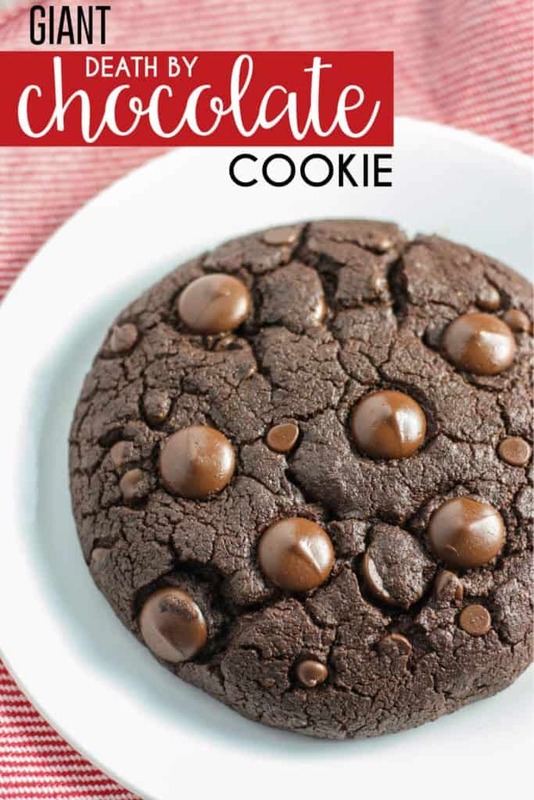 * I tested this recipe a second time using a flaxseed egg (2 tsp flaxseed + 2 tsp water) and an all-purpose gluten-free flour blend and cookie was semi-crumbly. If you’re GF/Vegan, you can certainly go this route, but the texture of the cookie will not hold together as well. 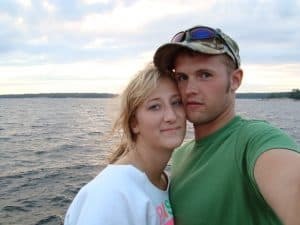 How did you and your SO meet? Any other “high school sweethearts”? lol I will never forget it! An old red ford Taurus is what he drove 😉 Thanks Brie! That is the cutest story ever! I think you and I are probably a lot alike when it comes to relationships. I am a commitment phoebe in all aspects of life. That’s probably why I’m not married yet. That and I haven’t met a relentless guy either! Your story is so cute girl! Congrarts on almost a year. For us, the first year was the hardest and then it got SO much easier from there! I agree though, we don’t celebrate Valentine’s Day. BUT, I’ll eat this cookie anyway! NOMS. Pinned! Our first year has actually been really good! Learning to rely on each other, and be more supportive, it’s been good 🙂 I will also eat this cookie any day of the year. Thanks so much for pinning Taylor! haha awww I love that story of you and Drew! It’s funny how you didn’t really start liking him until he bribed you to be his girlfriend lol. And this cookie is absolute perfection! Oooh I wish had I seen this yesterday! I made chocolate mousse and I’m envisioning it on top of this and practically drooling!! Um, that mousse sounds amazing! Mmmmmm yes!!! I’m not a big Vday person either – I prefer going big for Bday’s and anniversaries. But I’ll take any excuse to eat chocolate!!! Your story is so cute and funny. I love your honesty and humor! My hubs and I met at a bar. SOOOOO romantical…. Your story is hilarious, definitely one for the books! I am going to make a gluten free version of this then eat it for breakfast, lunch and dinner! Haha! This cookie looks like a pillow! A pillow of chocolate-y goodness that I want to stick my face in. Love your love story and I love how persistent he was. More men need to be like that! I didn’t start using my own name on my blog for like a year due to stranger danger (LOL) and then just called Dave “the BF” for a good long while so I totally get not sharing names haha. And of course the recipe looks amazing, lady!! For Vday, I was sick so…we stayed at home and watched TV hahaha. PS Ray and I met/started dating at the end of HS, too!! Twinsies-ish??? My only substitution was using regular almond butter, not a chocolate version. It was still sooooo dark chocolatey and perfect a little warm with a scoop of ice cream!!!! Andy also loved it, obviously. 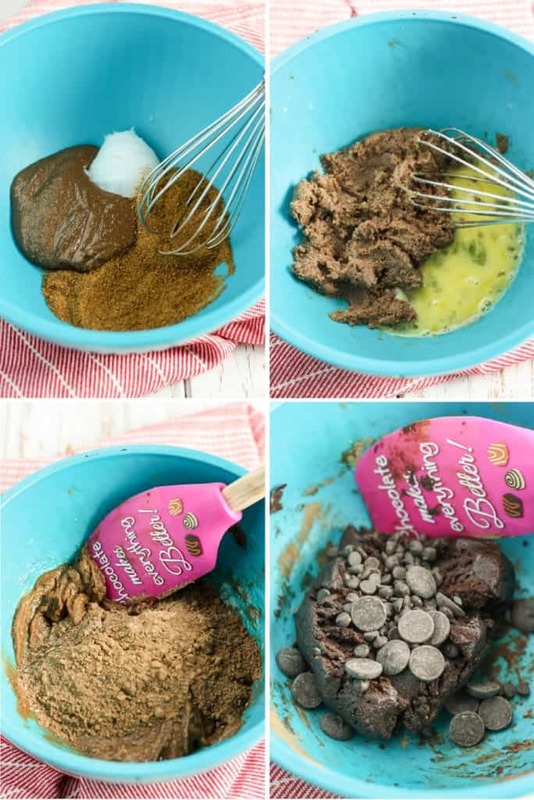 This recipe makes the most tasty cookie! I split it into 3 medium sized cookies to suit my needs. Yum, thanks! Oh yay! So glad you enjoyed and glad it worked in 3 for you. Awesome idea 🙂 Thanks so much for sharing! It could! I haven’t tried it myself… It might just make for a more “cake-like” texure. I’m not sure the pumpkin flavor would come through with all of the cocoa. However there is a pumpkin skillet cookie under “desserts” and if you don’t have a skillet you can divide into ramekins, just watch baking time about 15 minutes?